Apparently, I just obtained a Ninja 300. This one belonged to a friend for a while as their first bike until in ended up on it’s side in a ditch. From there, it sat in the back of a garage for a while waiting to get fixed. 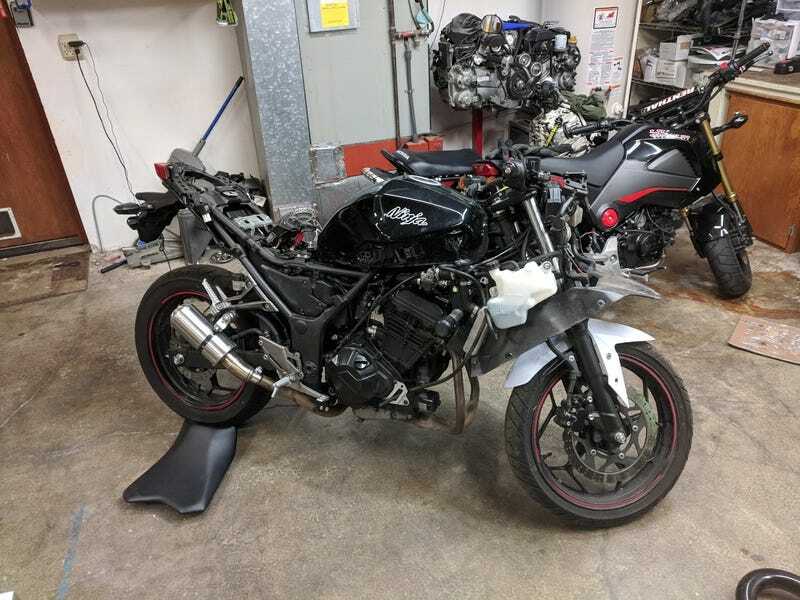 The owner ended up buying a Moto Guzzi earlier this year so I expect the Ninja dropped down into the “this will never get done” section of the do do list and proceeded to take up room in the back of their garage. Anyway, picked up the 300 yesterday, got it into the garage and surveyed the overall picture. Frame looks to be untouched, forks not bent, with the upper fairings and gauge mount taking the brunt of the damage. The engine wouldn’t fire at first, so on a hunch, I jumpered over the tip-over sensor reset the ECU and got it to run.